We’ve been expecting Prince Harry’s wedding to actress Meghan Markle for so long, it seems ages have passed since the initial announcement. Do we even need to say we watched the entire royal wedding live from our atelier, taking notes, smiling and crying like we were part of the event? Ladies, we watched history in the making! And it’s not just royal history. It’s fashion history. One of the most sought-after aspects of the royal wedding had been Meghan Markle’s wedding dress. We expected to see tons of luxurious Chantilly lace, organza, and obviously some appliqués. Kate Middleton’s wedding dress has set a standard that brides all over the world wanted and had dreamt about it. However, Meghan Markle played a different style card. And the result was fabulous. Not in our wildest dreams did we expect to see a royal wedding featuring a minimalist gown. But it was sensational and it has already swooned over brides’ hearts all over the world. 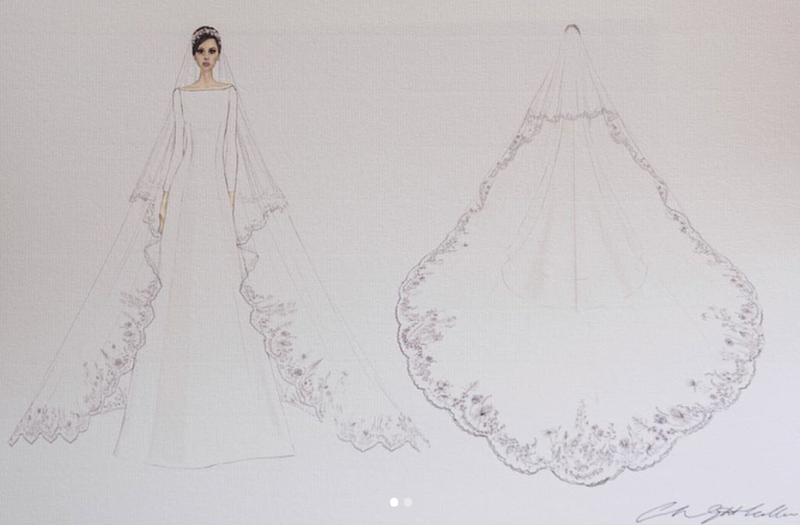 Markle’s wedding dress features three-quarter-length sleeves, clean lines, a bateau neckline, and a very simple silhouette. Designed by Clare Waight Keller for Givenchy, Meghan Markle’s minimalist wedding dress “epitomizes a timeless minimal elegance referencing the codes of the iconic House of Givenchy and showcasing the expert craftsmanship of its world-renowned Parisian couture atelier founded in 1952." The Duke Duchess are pictured together on the East Terrace, Windsor Castle - Image via The Royal Family, on Facebook. Kensington Palace adds in their statement about Meghan Markle’s royal wedding dress that the focus was “the graphic open bateau neckline that gracefully frames the shoulders and emphasizes the slender sculpted waist”. And we couldn’t agree more. The delicate off-shoulder detail adds to this gown’s irresistible charm. The Duchess of Sussex made a worldwide fashion statement. Minimalism now stands for ultimate luxury, sophisticated elegance and exquisite craftsmanship. It’s now set in stone that minimalism is all about modernism, simplicity, and femininity. Looking for more bridal inspiration? Check out our article about the 5 wedding dress trends to swoon over in 2018! From wedding jackets crafted in lace or taffeta to bridal gowns and shorts that show off the legs, this year is all about the modern bride who wants a WOW look that highlights her unique style and personality. Dreaming of the perfect wedding dress for you? Book an appointment in our Bucharest showroom and let us help you find the ONE. Through our unique approach to creative design, fabric pairing, impeccable finissages and delicate shapes, we have designed a selection of gowns that complement a woman at her most memorable occasions. We offer a wide choice of elegant shapes and necklines, both for bridal and evening, to make sure each woman finds the dress that will bring out the goddess in her heart. Visit us at our headquarters in Bucharest, Romania (Episcopul Chesarie 12) for a chance to see our beautiful bridal collection. Contact us here to book an appointment for the most important dress you will ever wear.